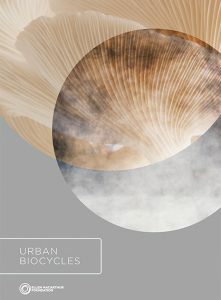 This scoping paper focuses on the potential of the significant volume of organic waste flowing through the urban environment. the equation can be reversed by designing more effective recovery and processing systems to turn organic waste into a source of value and contribute to restoring natural capital. The objective of this scoping paper is to present an initial exploration of the circular economy opportunities for the biocycle economy. It presents the first steps towards a deeper understanding enabled by a more comprehensive analysis. The Pearl technology developed by Ostara is a closed loop nutrient recovery solution. It can recover 85% of the phosphorus and up to 15% of the nitrogen from municipal and industrial wastewater streams, and transform them into a highvalue fertiliser. According to Ostara, nutrients crystallise into highly pure fertiliser granules and grow in diameter after the addition of magnesium in a controlled pH setting. Once they reach the size required for standard fertiliser blends, they are harvested, dried and bagged, ready for immediate distribution and sale. The fertiliser recovered by the Ostara process has a distinctive crystalline composition that releases nutrients when acids are given off by growing plant roots. This maximises the efficiency of phosphorus uptake and therefore minimises phosphorus leaching and run-off. The process helps to ensure that the plant absorbs the nutrition, thus contributing positively to the growing cycle as opposed to nutrients being lost in waterways. Capital costs are recouped in 5-10 years through annual savings in chemicals, sludge disposal and maintenance, as well as revenue from Crystal Green fertiliser sales. In addition, the solution helps protect local waterways from nutrient pollution (through lower application and release rates, and lower water solubility) at a time when clean water, food security, fertiliser runoff and growing populations are issues for communities around the globe. The use of one tonne of Crystal Green eliminates approximately 10 tonnes of CO2e emissions.